One bottle of Biozar® Original lasts for around two months. However, this depends on whether you take a maintenance dose or a daily dose. We will send Biozar free of charge! Always consult your doctor for use in combination with medication. When should you avoid taking Biozar® Original? People who are overly sensitive to one of the ingredients are advised not to take Biozar® Original. This also applies to people who are undergoing immunosuppressive treatment. We advise you to stop taking Biozar® Original if you experience abdominal sensitivity or tingling in your hands and legs for a few days, or if this worsens. We advise you to minimize your alcohol consumption, or even stop completely. We also advise you to drink at least 1 to 1.5 litre of water per day, as water helps rid the body of toxins while you are taking Biozar® Original. A nutritional supplement is not a replacement for a varied, balanced and healthy lifestyle. As far as is known, Biozar® Original can be taken during pregnancy and breastfeeding without problems, based on the recommended dose. Biozar® Original must be kept in a refrigerator. Keep out of reach of children. Do not place in direct sunlight. 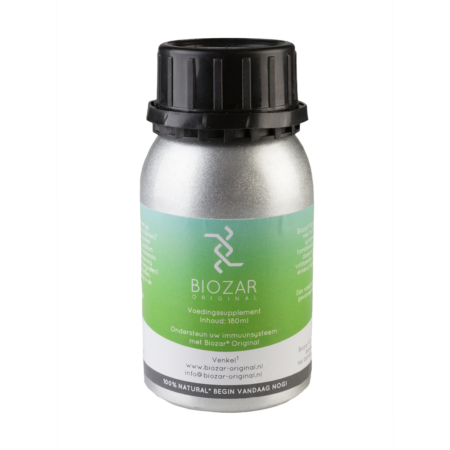 Biozar® Original is packaged in 180 ml bottles that have a special lining to protect the product. Make sure that the contents of the bottle do not come into contact with other substances as this may reduce the effect of Biozar® Original. Leave Biozar® Original in its original bottle. Schisandra chinensis (Wu Wei Zi) 1 g, natural sweetener (Steviol glycosides**), micro-organisms (actinomycetes) and water. Gluten-free and contains no colourings. **Steviol glycosides are naturally present in Stevia leaves.